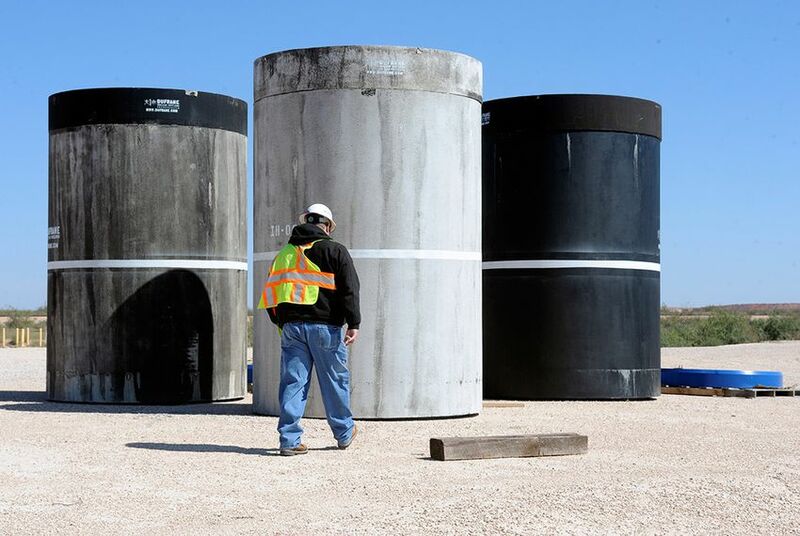 UPDATED: Texas’ only radioactive waste site has permission to dramatically expand its capacity, take in new types of waste and reduce its financial liability should its owner suddenly close up shop. Texas’ only radioactive waste site has permission to dramatically expand its capacity, take in new types of waste and reduce its financial liability should its owner suddenly close up shop. The Texas Commission on Environmental Quality on Wednesday voted unanimously to amend a license held by Waste Control Specialists, which operates one of the few low-level radioactive waste disposal sites in the United States. The commission also denied State Rep. Lon Burnam's request for a contested-case hearing on the issue. The change allows the company to dispose of 9 million cubic feet of radioactive material. That is more than three times the 2.39 million cubic feet the license currently allows. The ammendment would also let company dispose of depleted uranium – material commonly used in manufacturing federal weapons and armor. Also under the amendment, and if a separate commission proposal also goes through, the company could dispose of “Greater Than Class C Waste,” the most highly radioactive materials classified as “low-level” radioactive waste. The amendment would also slash more than $50 million from the $136 million in “financial assurance” that the company is paying the state – the mix of cash and securities that would cover costs should the company see an accident or suddenly abandon the waste. The commissioners' vote came after hearing comments from Burnam's office and environmental groups who opposed the amendment. Cyrus Reed, conservation director for the Lone Star Chapter of the Sierra Club, said allowing the company to expand while lowering its liability "really does seem to fly in the face of rational decision-making." The commissioners said they needed to reduce Waste Control Specialists' liability because the company's current site is smaller than what was planned years ago, making it cheaper to clean up any accidents. The commission says it will recalculate the bond whenever the company expands. The commissioners only discussed the financial liability issue. They did not allow comments on the site's expansion. Waste Control Specialists applauded the vote. Texas’ only radioactive waste dump is poised to get permission to dramatically expand its capacity, take in new types of waste and reduce its financial liability should its owner suddenly close up shop. That’s despite a last-ditch protest from a state lawmaker who worries the move will jeopardize Texans’ health and put their tax dollars at risk. The Texas Commission on Environmental Quality on Wednesday will consider major changes to a license held by Waste Control Specialists, which operates one of the few low-level radioactive waste disposal sites in the United States. The 13,000-acre site in Andrews County, northwest of Midland, is the final resting place for hazardous waste and slightly radioactive items from shuttered nuclear reactors and hospitals, among other locations. The company, formerly owned by the late Dallas billionaire Harold Simmons, along with state and federal regulators has repeatedly called the site safe. But environmental groups have scrutinized the company as it has expanded the scale of waste it accepts, raising concerns about the effects on groundwater and other natural resources. Under an amendment to its license, the company could dispose of 9 million cubic feet of radioactive material. That is more than three times the 2.39 million cubic feet the license currently allows. The change would also let company dispose of depleted uranium – material commonly used in manufacturing federal weapons and armor. Also under the amendment, and if a separate commission proposal also goes through, the company could dispose of “Greater Than Class C Waste,” the most highly radioactive materials classified as “low-level” radioactive waste. In its two years of operation, the company has only filled up a fraction of the space its license allows. Though the company’s business is growing, it has disposed of just 51,000 cubic feet of radioactive junk. Chuck McDonald, a Waste Control Specialists spokesman, said the company has no current plans to build out its facilities, but lawmakers want assurances it will have space to meet long-term demands. The Andrews site, for instance, has been tapped to house waste from Texas’ nuclear generators when they are decommissioned in the coming decades. State Rep. Lon Burnam, D-Fort Worth, is trying to stop – or at least slow down – regulators’ deliberations on the changes, saying the expansion would “increase dangers to the public and the environment," while reducing the company’s financial assurance would shift more of the company’s liability onto Texas taxpayers. The long-time critic of the disposal site says the amendment is big enough to merit a contested case hearing – a drawn-out process resembling a trial in which companies and their critics present evidence and testimony in front of an administrative law judge. Burnam said he does not currently have concrete evidence that the amendment would endanger public health, but a hearing would allow him time to gather it. But regulators are unlikely to grant Burnam’s request. The environmental agency, supported by recent court rulings, has set a high bar for triggering such hearings, and the Office of Public Interest Counsel has recommended against a hearing, saying the lawmaker is not an “affected person” by the amendment – in part because his district sits about 350 miles from the waste dump. Burnam and other critics have questions about whether the millions of dollars Simmons donated over the years to Republican state lawmakers, including Gov. Rick Perry, influenced state decisions on waste policy, but Simmons had said he believed that Perry had Texans' best interests in mind. The Sierra Club, which has also opposed nuclear waste disposal in Texas, voiced concerns similar to Burnam’s in public comments to the commission. In his response to those comments, Richard Hyde, the commission's executive director, defended the proposal point by point. The amendment “does not pose potential health, safety and environmental impacts, in other words, it is not dangerous,” he wrote. In making such determinations, the agency says it relies heavily on a review the company submits each year. Terry Clawson, an agency spokesman, said the agency’s staff “performed a detailed technical review,” of the document, while engaging in “a regular dialogue” with the company about the site’s conditions. McDonald said the amendment is simply an effort to square up the waste dump's realities to what regulators assumed when it was evaluating the company’s original application about 10 years ago. For instance, the U.S. Department of Energy has since more fully studied disposal of depleted uranium. Also, the current waste site is smaller than what was described in the license. That’s the reason for reducing the company’s financial assurance. If the company builds new facilities, the commission says it will recalculate the liability. Disclosure: The Harold Simmons Foundation is a major donor to The Texas Tribune. A complete list of Texas Tribune donors and sponsors can be viewed here.